Enjoy the cleanest, freshest drinking water in a flash. 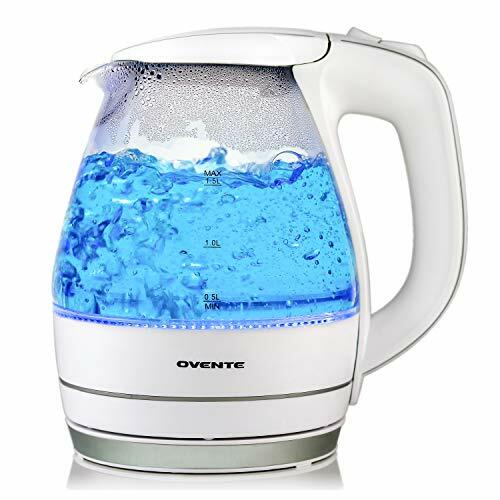 The Ovente KG83 Series Electric Kettles are our best sellers for a reason. Their unique, modern, and stylish design looks great on any countertop and comes in 8 eye-catching colors: black, white, red, green, orange, pink, purple, and maroon. A halo of blue LED lights beautifully illuminates the pot when it’s in use, so it’s not only practical, but very attractive to look at. With its 1.5-liter capacity, 1100-Watts of power, and high quality stainless steel/borosilicate glass construction, this handy kettle can quickly bring water to a rolling boil in less than 7 minutes (at maximum level). In a matter of minutes, hot water will be ready to use for instant coffee, tea, hot cereal, instant macaroni, soup, or oatmeal. It’s also proven to be 50% more efficient than traditional stovetops in reducing your daily electricity use, which helps save you money. Convenient, safe, and helps you become the healthiest you can be. This kettle features a concealed water heating element to help prevent extra objectionable mineral deposits such as nickel (a common allergen) found in your drinking water. It also features a flip-back lid that opens with one touch, and an adjustable opening wide enough to fit your fist for convenient filling and cleaning. For safety purposes, it’s equipped with Automatic Shut-Off upon boiling and Boil-Dry Protection Technology which automatically shuts off the kettle when no water is in the carafe. It also comes with a secure locking lid, LED indicator lights, a removable/washable filter, and a comfortable stay-cool handle and button. It’s also easy to store—its 30 inch cord wraps neatly into its base for a clutter-free space.